Tammy Gross is a musician, writer and die-hard volleyballer. Developing extraordinary tools for musicians has been a number one priority for over 25 years. Now it's time to write! This blog follows the exciting world of historical biography, research, & screenwriting. I’m PUBLISHED! My books are the first titles with Reel Novels Publishing, a unique new publishing imprint for screenwriters. Last week, I had a great book launch at the book signing with other 1715 fleet authors in Vero Beach where the 300-year anniversary of the story’s true events took place. More book signings are in the works. This is NOT about making money; it’s about the number of sales. Thus, the retail prices are as low as possible. The more books sold to individuals, the more attractive to a potential investor &/or production company to get the movie made! Please get your copy ASAP & tell your friends & associates! The true, award-winning story about a general’s son who must confront pirates, cannibals and an angry king after a hurricane devastates the family’s fleet carrying $400 million in Spanish treasure. A FAST read (175 pages) with 49 full-color images of original artwork! This historical adventure is suitable for all ages, but the reading level is best for 5th grade & up (a lot of Spanish words thrown in). The book version was written in ONE WEEK! But the original story took 6 months of development as a screenplay (+ years of research). Sales of this book all go to making the movie a reality. The fate of a kingdom rests on the young shoulders of a peasant girl and her love for a hellion whose disregard for the Testament Scrolls may lead to their permanent annihilation. A longer read (431 pages). This Christian/fantasy/adventure/romance is suitable for high schoolers & up. Started in 1988, this took 4 years to complete & is published under my pseudonym (TK Blackburn). 2015 is its first publishing! Again, this isn’t about making money. It’s about making the story available to anyone interested. Once you’ve bought your version of either book, be sure to register at the link in the back of the book. You’ll be notified of any book revisions & upcoming titles. My award-winning thriller Evangelina will be published in early Fall 2015. 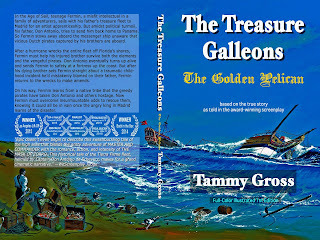 The Treasure Galleons - the script - the book - the mini-series! It's official. The Treasure Galleons is a BOOK! After winning 8 (actually 9, but I must keep the latest win under wraps for now) awards, including 2 wins, the screenplay has been adapted into a very colorful novella. Chock full of original paintings by the talented Peggy Gross (my mommy), it also sports a wonderful cover painting by Cornish painter Ralph Curnow. The painting also marks the midpoint of the story. You can order now, or better yet, get your SIGNED PAPERBACK at the wonderful book signing event Monday, July 27th at the very spot where the events happened exactly 300 years ago (Vero Beach, FL). Hope to see you, but if I don't, be sure to order that ebook. The more copies distributed, the more likely it WILL be made into a MOVIE (or a mini-series)!! THE TREASURE GALLEONS - ANOTHER WINNER! It's still a work in progress, but a couple weeks ago I decided to get some quick, objective feedback from a few contests (often a cheaper & more effective way to get fast, honest feedback than hiring consultants). Back in the Box: I WON! BEST ORIGINAL FEATURE SCREENPLAY! Ironically, I haven't gotten the wanted feedback yet, but I'd say the placements tell me something! In a couple weeks, I'll be talking with my development producer about how to proceed with MAKING IT INTO A FILM in 2015!!! More to come, but let's just say things have gotten interesting since my last post. Four of my screenplays all garnered new interest this past week. That means I have four screenplays to look at with fresh eyes & do some rewrites. That means, as usual, very little time to devote here. EVANGELINA - A multi-award-winning feature based on true events. A traumatized teen, who is either crazy or psychic, tries to help the victim of an unsolved murder to find peace. UNDER THE WILLOW - A short version of the touching true story of Chicago's strategic & spiritual importance at the dawn of the Civil War. A troubled young man finds purpose for his life when he joins the cause for God & country. A PIRATE'S CHOICE - An award-winning short about the humble beginnings of a later-to-be famous pirate in the early 18th century. 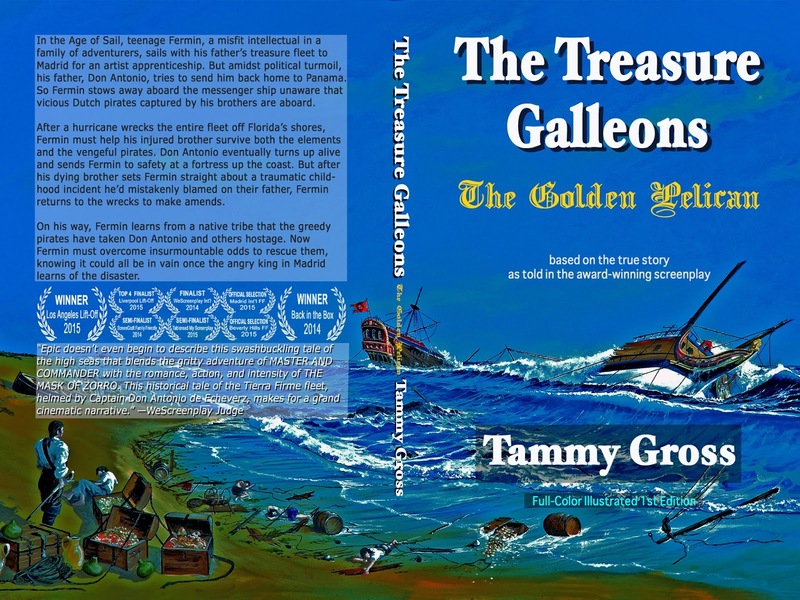 THE TREASURE GALLEONS - The epic true story of Florida's Treasure Coast... A family endeavors to bring treasure from New Spain to the king in Old Spain despite pirates, mutiny, a hurricane, family tragedy, & much more. OK, in re-reading Part I, it's obvious that there is nothing more boring than reading a story with a writer (especially a braggart) as the lead character! The winning script was completed at a 48-hour retreat put on by the good folks (Signe & Bob) at the Great American Pitchfest (GAPF). The setting was inspiring for a spooky thriller: the haunted hotel where Stephen King wrote "The Shining" in the Colorado Rockies. To capitalize on the weekend's theme, I decided to set aside all my historical story projects and work on an idea for a paranormal thriller I'd outlined one weekend after learning about a heartbreaking unsolved murder. With screenwriting guru Pilar Alessandra to guide us through a day of exercises to get us going, a group of dedicated writers sat in an old room filled with ghost-like vibes, and eked out our outlines and several pages, then for the next two days we wrote...and wrote. Two of us completed our scripts while everyone went away with a strong start. About a month later we all converged on GAPF to pitch our now complete and polished projects. I had lots of requests. The next month I took my story to my private critique group and they tore it to shreds. I took the notes to heart and made revisions then entered a couple of contests, just to get more outside feedback. The feedback was helpful, so I made more revisions/tweaks and entered several contests, again just hoping for feedback & MAYBE a placement. Apparently those final revisions did the trick. The script has done well in all but one of those contests, winning the grand prize at StoryPros. GRAND PRIZE: I won another contest! A big one this time. My script was up against about 825 scripts, so it's kind of a big deal. If I can't brag on my own blog, where can I? I received notification at the end of a very long & ironic day on December 15, 2013. I had spent the entire day sending prizes for my services for the first cycle of a contest that I had just co-founded: Reel Writers Screenwriting Competition. When I got the call, I didn't know what to expect since I found a phone call (from anyone) to be an odd method of contact for an online contest. It never once occurred to me that I could have won. In fact, when the very nice guy, Jeff, told me I was Grand Prize winner, I did not believe him. I thought someone was messing with me. When he convinced me it was legit, & that he had personally really loved the script, I had to stop him & ask...which one? Two of my screenplays were entered in the contest. While I had done some tweaking to make both better, I had actually entered them into the contest for the feedback. It had mildly surprised me when both had moved on to the finals round, but I attribute that to good prose. I know that I have an advantage over other writers with my good grammar skills (though I'm as susceptible to typos as anyone, & without someone else to edit me, mistakes do happen!). And I do know the "language of screenplay" better than most spec writers. After all, it's what I do for a living - correcting others' prose. But as a fluid storyteller, I do struggle quite a bit. I fully understand the craft, but it's very difficult to execute. So it never dawned on me once that I was a serious contender for any prizes! And it was anyone's guess which script had captured their judges' attention. Shroud of Mystery is the realization of an idea I'd had back when the Shroud of Turin was in the news a lot when scientists had erroneously carbon dated it, pronouncing it a fake from the Middle Ages. It's probably the best original story idea I've ever had. However, turning it into a compelling thriller has been a very difficult process, & frankly, it still needs a lot of work, even if it did make it to the top 4% of the pile. Evangelina was an idea that germinated a year or two ago after watching one of those dumb paranormal TV shows that try to convince people that there is "evidence" where in the end there always is none. This episode was no different, but there was a storyline that caught my attention. A teen claimed to be communicating with the spirit of a dead girl with whom she identified. It turns out that the dead girl's story is all over the internet, so there's no mystery how the teen got all the details about the dead girl, but what struck me in the story was how that poor girl was murdered 20 years ago, & not only has the crime never been solved, but mediums like these phonies on the TV show have been coming out of the woodwork to keep the tragedy active, dangling hope in front of the mourning family without ever providing any answers. So I asked: What if a medium turns out to be schizophrenic, truly believing that she's communicating with the murder victim, but never really sure since it's possible she just read about it on the internet & forgot? Thus, my grand-prize-winning script was born: Evangelina. 1st place for short screenplay. To read the version I sent to the contest, CLICK HERE! I'm basically a songster turned screenwriter. Seems I'm following in a cousin's literary footsteps. Joyce Blackburn (1920-2009) was an author and lifelong friend/research assistant for historical novelist Eugenia Price. Like Joyce, I have discovered (later in life) a great love for historical research, and have always been fascinated by the fantastical stories of real-life characters. I love to see fiction and history weaved together in a compelling way.